I’m working my way through Tula Pink’s newest book City Sampler: 100 Modern Quilt Blocks with some quilty friends of mine. One of the cool things about this book is that the author encourages you to name your own blocks, providing numbers to reference them by. Here’s my version of #87. I call it “Hide the Cottons!” It reminds me of a map of a fabric store. Not a quilt shop, mind you, but a JoAnns-ish fabric store. Where are buttons? All over the store. Where’s the fabric? Easily accessible and plain to see. 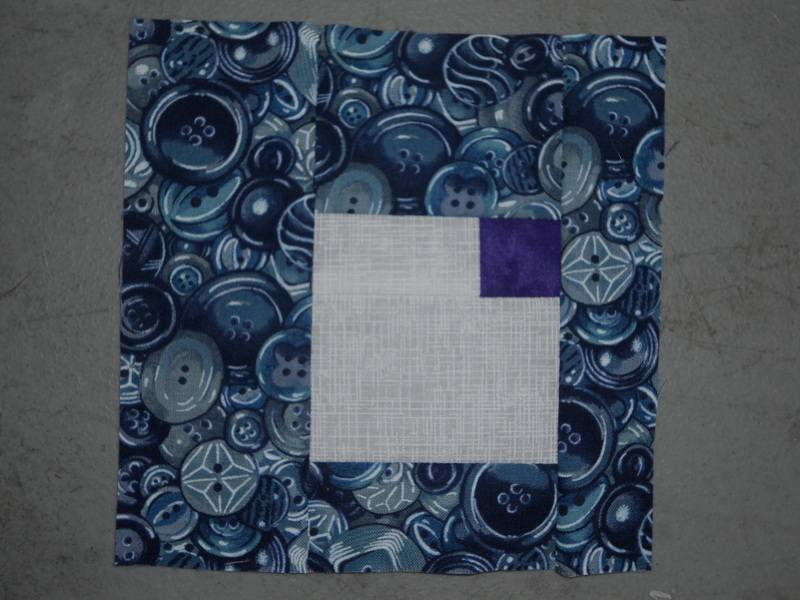 How about the quilting cottons? Well… those are hidden in the dark recesses of this itty-bitty corner where the dust bunnies breed. Ugh! Speaking of bunnies, I had the chance to meet one that wasn’t made of dust (or cat hair) this weekend! 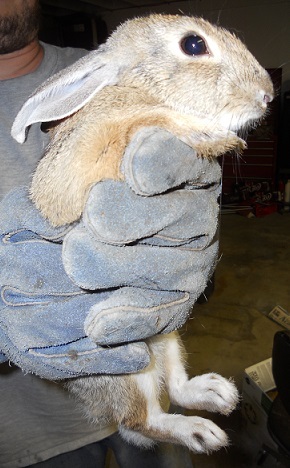 Our neighbor’s cat chased him into the garage, where we had to move a bunch of boxes and poke him with a 2×4 before he was caught. 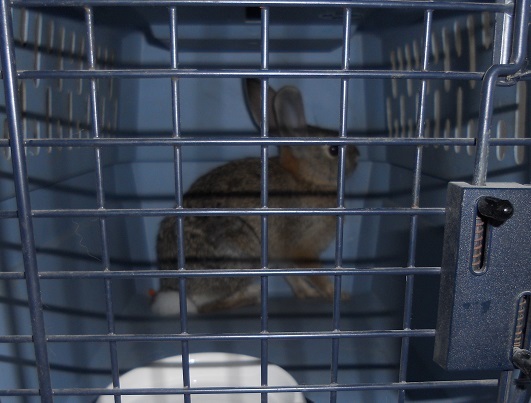 We decided to put him in a cat-carrier cage until the neighbor’s cat had been let in for the night, hoping to save little cotton tail from becoming dinner. I even offered him some carrots but he was busy being scared out of his mind. Here’s the little guy in the carrier. 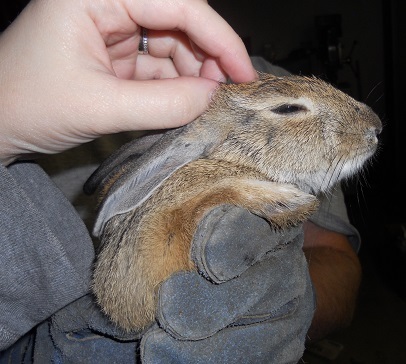 When it was time to let him go, my husband picked him up with welding gloves on. Wild animals are known to bite, right? Safety first! I gave him some pets before he hopped home. He calmed right down and squinted his eyes when I stroked the top of his head and the base of his ears. Hubby said his heart-rate slowed way down, too, from what he could tell through the gloves. This entry was posted in Art, Artist's Studio, Inspiration and tagged art quilt, artist, bunnies, bunny, buttons, cage, cat, city blocks, cotton, cottons, dust bunny, fabric, fabric store, house, JoAnns, modern, notions, quilt shop, quilting, quilts, save, sew, Tula Pink, what the cat dragged in on October 14, 2013 by quiltartbymegan.